It’s time again for the ever popular Under The Covers podcast, where it’s all covers, all show long. 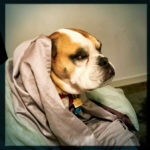 Normally the covers podcast comes just when it’s starting to get frosty out, but even with spring in the air there are still chilly nights where you want to burrow under the covers (like Cordelia the Bulldog). This week’s podcast features covers from the likes of Morrissey, The Red Hot Chili Peppers, Gábor Szabó, The Chocolate Watchband, Alex Chilton, John Martyn,and many more. So come join Scrappy for a show that’s always a fan favorite.